Few childhood milestones spark more parental anxiety than birthday celebrations. These days, there’s more than cake at stake: Per the International Association of Amusement Parks and Attractions, parents fork over an average of $370 per party just for the venue, and total spending can easily top $500. Add in the pressure of a once-in-a-lifetime event – your baby only turns 5 once! – and the stress can pile on. Is your child's birthday coming up, but you have no time to plan and prepare the perfect birthday party? Fear not. Choosing a venue to hold your birthday party will save you time in planning, preparation and cleanup. Most importantly, the birthday kid and guests will have a blast. Here are a few party places that kids – from toddlers to teens – will love. When you call, ask what amenities are available and included. Many places provide invitations, food and cake, balloons and decorations, a private party area, fun activities, and other special birthday services. Whether party planning makes you swoon or sweat, it’s possible to plan a party that both you and your child will enjoy. 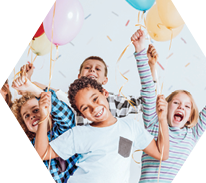 Read on to keep the “happy” in your child’s birthday, from the first party all the way through the teen years. Petite parties. For babies and tots, parents are free to select the party theme (since the little one probably can’t weigh in) and design the guest list to suit the party venue. A common mistake: Going overboard and inviting the entire pre-k class, creating a gigantic, noisy shindig that overwhelms the birthday child, says event planner Grace L.P. Beason. “For preschoolers, I've found that it works well to keep the number of kids down to really close friends and siblings, rather than inviting the entire class. The party can get huge once you include all the parents.” When it comes to party size, take your cue from the season: Winter parties are often indoors, so the cold months are perfect for smaller parties with indoor activities like crafts and games, while the warmer months are ideal for the-more-the-merrier parties at parks and other outdoor locales. Manners mashup. The birthday party scene picks up steam in elementary school, and parents of grade-schoolers often find themselves juggling multiple party invites in a single weekend. This can lead to some party etiquette pitfalls, says event planner Lori Losee. When guests are invited to so many parties, overwhelmed parents often fail to RSVP on time or at all. “This is my biggest pet peeve,” says Lori. “Also, not bringing a card or gift unless specified by party host not to bring one, or bringing uninvited siblings to parties.” Grade school usually signals the start of drop-off parties, notes Lori. Just make sure to check with party hosts about whether you’re expected to stay or go, and what time the party ends, and always pick your child up on time; party hosts are usually beat afterward and nobody wants to wrangle an unexpected party straggler after the other revelers have gone home. Creative craze. The teen years can be an awkward birthday phase for parents: Older kids may balk at the themed parties they enjoyed in grade school or reject parents’ party ideas outright. But it’s still possible to plan something festive, even if teens don’t want a traditional party, says Grace. Instead of bailing on birthday fun, get creative: “Why not try to get some great concert tickets to a local band (for teens or for tweens with parents escorting), rent out a private room at a fun Mexican place and have a fiesta with a piñata and dancing, or learn how to make ice cream at a local ice-cream parlor. Explore your local business community!” For inspiration, draw on your teen’s favorite pastimes. Activity-based parties – think cooking, jewelry-making, science, or rock climbing – are trending, making it easy to dream up a festive, memorable fete that even a too-cool teen will enjoy.